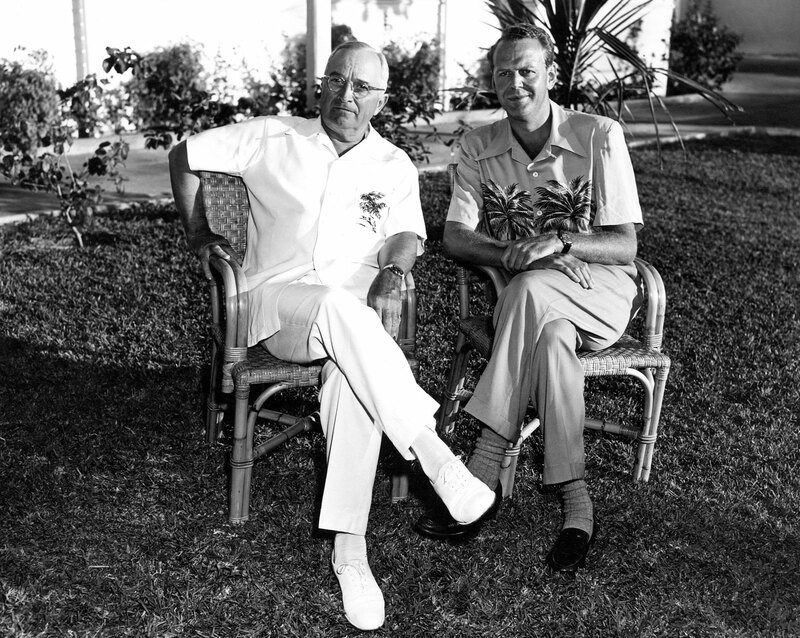 Harry Truman, left, sits with White House counsel Clark Clifford in Key West in December 1949. “The history of Palestine and of Israel’s founding cannot be changed,” John B. Judis writes at the end of Genesis, “and it is silly to play games of what-if. But it is not silly to draw lessons from the past that are relevant to the present and the future.” Judis is a keen political observer, and the many lessons offered in his new book deserve our attention. But he divines some of them, in spite of his better judgment, by asking “what if,” insinuating the possibility of a better presidential decision and exploring why it was not taken—much as Gar Alperovitz did in The Decision to Use the Atomic Bomb. At its best, Genesis is this kind of imaginative mulligan. And the decision Judis would want to do over is also Harry Truman’s, namely his determination to bury the Morrison-Grady plan during the summer of 1946, which led, Judis argues, to an unworkable partition, the premature recognition of Israel—and endless war. Truman, American Jews, and the Origins of the Arab/Israeli Conflict. You probably haven’t heard of the Morrison-Grady plan, but you may have read angry denunciations of Genesis in The Wall Street Journal, The Jerusalem Post or Commentary claiming that Judis questions the legitimacy of Israel. This is wrong and, given Judis’s obvious empathy for Israelis as well as Palestinians, also reckless. What Judis explores in the Truman administration’s serial decisions about Palestine is an illuminating analogue to the record of, most recently, the Obama administration’s approach to the peace process. What’s “relevant to the present and the future” is Judis’s supposition that any Israeli-Palestinian settlement will require American steadfastness, and that presidential fairness toward the Palestinians, as with Truman, may be foiled by the incessant agitations of the Israel lobby, promoting Zionist excesses. The danger for any historian writing with these ambitions is that the more intentional the analogy, the more calculated the history. To tell a story for the sake of its moral is to tell it slanted. The latter part of Judis’s book constitutes a detailed, absorbing study of Truman’s attempts to deal with the interests of American Zionist organizations and their leaders, and the electoral politics and Cold War pressures of the late 1940s. Here and there I thought Judis rash in his criticism of American Zionist leaders or obstinate about the importance of the back-room pressures they exerted—but never mind. Had these chapters stood on their own, they would have formed a provocative, learned, even masterful book. The first part is another matter. Judis wants to explain the prehistory of these pressures, so he describes the origins of revolutionary Zionism and the record of the British Mandate, up to the time a more vicarious American Zionism took root in the 1930s. Judis offers some fine portraits of early American Zionist leaders like Supreme Court Justice Louis Brandeis as well as a reasonable summary of the growing war between the Zionist colonists and the Arabs of Palestine, a conflict precipitated by contradictions in British policy. But on the whole, his version of Zionist ideas, congresses and settlement policies—the disruptive force in this history—serves his argument about Truman rather too conveniently. Ironically, Judis’s presentation of Zionism suffers from some of the same imaginative limitations he attributes to the American Zionists. He assumes that leading advocates for the Jewish “national home”—from Chaim Weizmann, president of the World Zionist Organization, to David Ben-Gurion, the preeminent founding leader of Labor Zionism and Israel’s first prime minister—were intent all along on founding an exclusivist “Jewish state,” one that justified itself by claiming a world of intractable anti-Semitism and that required, almost by definition, the suppression or expulsion of Palestine’s Arabs. By implication, Israel’s democratic deficiencies and post-1967 occupation were prefigured by the Zionist movement’s original intent: every Zionist leader of note had a little Sheldon Adelson inside struggling to get out. This part of Judis’s story, as Marx said of the Young Hegelians, supposes that men drown because they are possessed of the idea of gravity. It is a charge he can’t prove in an indictment that would have been stronger without it. By the fall of 1945, the issue of Palestine remained explosive and unresolved. The Arab revolt, which had begun in 1936 and was crushed by British forces by 1939, had left the Palestinian leadership exhausted or expelled and many ordinary Arabs burning with hatred for the British occupation. To the Palestinians and the neighboring Arab countries shaped by European colonial rule since 1917, the Balfour Declaration’s promise to Zionism was a bone pushed down their throats. By 1937, the Arab world had organized in support of the Mufti; by 1946, the Mufti, though in exile after supporting Hitler, had regained control of a fractious Arab Higher Committee—by then, the default political voice of the Arabs of Mandate Palestine. The Palestinians supposed that those Arab states that had achieved a measure of independence could halt Zionist colonization, but only if the British finally departed. They were firmly opposed to the immigration even of the 100,000 Jews remaining in European displaced-persons camps. The Mandate had, with reservations, enabled Jewish immigration and land purchases; the British essentially put an end to both with the White Paper of 1939, which left the Zionists inflamed as well: they had counted on hundreds of thousands, if not millions, of immigrants from Poland and the Soviet-occupied republics when they rallied to the Biltmore Resolution of 1942, which called for Mandate Palestine to be established as a “Jewish Commonwealth integrated in the structure of the new democratic world.” Three years later, the Zionist movement was absorbing the double shock of the Holocaust: an intensified hunger for self-determination, wedded to the realization that most of the Jews who would have built the state were dead. The half-million or so people of the Labor Zionist–led state-within-a-state thought themselves insurgent but under siege. The Yishuv, the Zionist colony, was enriched by providing construction and other services to the British army during World War II; the Haganah, Labor Zionism’s defense forces, and the Irgun, the rightist terrorist underground, were increasingly organized, nearing 25,000 men and women under arms. The new Labor government in Britain was doubtful that the country could maintain a colonial administration even in India, let alone preside over a Palestinian occupation it had no appetite to extend without some kind of political settlement reinforced by American power. Truman was finding his way in the Middle East, and the State Department, under James F. Byrnes, was increasingly preoccupied with the Soviet challenge in Eastern Europe. With the huge American army demobilizing, the State Department was keen not to alienate the Arab world or lose access to Gulf oil. Nevertheless, crucial US midterm elections were approaching in the fall of 1946—which, Judis shows, gave Zionist leaders their opening. Politicians and publications with strong Zionist sympathies, including Senators Robert Taft and Robert Wagner, The New York Times and this magazine, were advocating forcefully for a vague notion of Jewish statehood, beginning with finding an urgent solution for the 100,000 Jews still in camps. Public opinion was strongly Zionist, but Truman’s feelings for “the underdog” did not mitigate his reliance on the State Department. Growing as a counterweight, however, was an informal Zionist lobbying effort, led by American Zionists like the firebrand Rabbi Abba Hillel Silver and the more moderate erstwhile friend of FDR, Rabbi Stephen Wise. The two men did not like each other much—Wise thought Silver an “extremist”—but they eventually improvised a common front under Ben-Gurion’s discipline.All of this set the stage for Morrison-Grady and its vexations. Clearly, the fate of Palestine would be determined by an evolving Anglo-American partnership. Truman and Clement Attlee, the new British prime minister, agreed to appoint a joint commission of inquiry—six representatives from America, six from England: judges, writers, politicians—that began its hearings in January 1946. The idea was to offer some kind of detailed compromise leading to a longer-term vision—an approach last taken up by the British Peel Commission in 1936–37. By April, an Anglo-American report was published in Lausanne calling for the immediate immigration to Palestine of 100,000 displaced Jews and the annulment of the White Paper’s restrictions on the Jewish purchase of Arab land. The report served as the basis for the Morrison-Grady plan, released in July and named after Herbert Morrison, the British deputy prime minister and a member of the commission, and Henry F. Grady, the US ambassador. It proposed a unitary federal trusteeship in Palestine: Jewish and Arab “provinces” would exercise self-rule under British oversight, while Jerusalem and the Negev would remain under direct British control. Britain would maintain responsibility for defense and foreign affairs and would also guarantee the administration of, and access to, the holy sites of Judaism, Christianity and Islam. Attlee made it clear to Truman that Britain would accept the terms of the plan—if the United States provided the necessary support. The Zionist leadership countered the Morrison-Grady plan with a proposal for partition, pushed by Nahum Goldmann, the Jewish Agency’s chief representative in Washington. Partition was actually meant as a step down from the Biltmore Resolution’s assumption of a state in all of Palestine; sovereignty now meant the taking of as much territory as might be feasible. This compromise did not sit well with Silver, who was by now a nationalist radical, a foe of the judicious Goldmann and persona non grata in the White House. It does not sit well with Judis either, even in retrospect; he assumes that any hypothetical division of land in the 1940s would have shortchanged the Arabs, who were two-thirds of the population and unlikely to get even half the land. Indeed, Goldmann’s projected Jewish state would have had a 45 percent Arab minority. In any event, partition won over the admirably pragmatic Ben-Gurion, who expected a very large Jewish immigration to augment his majority—and most Zionists in Washington fell into line. Goldmann presented his plan to an impressed Dean Acheson in August, reassuring the under secretary that partition was acceptable to King Abdullah of Jordan (who was keen to annex Arab Palestine and Jerusalem’s holy places), and that the new Jewish state would willingly join an Arab-dominated Near East Federation. Once partition became Jewish Agency policy, the Morrison-Grady plan was, in effect, moot. In October on the eve of Yom Kippur, Truman addressed American Jews, gesturing toward a compromise between partition and Morrison-Grady. But this was illogical, for the question that needed to be settled was how quickly, and under what circumstances, partition might be implemented: immediately, or after five years; under the auspices of an international force, or upon the withdrawal of the British administration? Truman continued to see the Morrison-Grady plan for a federated Palestine as an ideal solution to the conflict between Zionists and Arabs, but he would abandon any attempt to implement it. From then on, Truman had no solution of his own, but was buffered between competing plans from the Zionist movement and his own State Department. In the end Truman would accede to the Zionists’ pressure—not because he believed in their cause, but because he was worried about Democratic losses in 1946 and again in 1948. A pattern had been established that would prevail for the rest of the century. With Morrison-Grady having been superseded, Britain threw up its hands. The problem migrated to the United Nations, where the UN Special Committee on Palestine took over from the Anglo-American Committee. Not surprisingly, UNSCOP proposed a partition resolution in the fall of 1947 much like Goldmann’s. The committee’s hearings were boycotted by the Palestinians who mattered; Zionists, meanwhile, went into high gear, testifying before UNSCOP and lobbying the White House so intensely that Truman forbade meetings with all Zionist advocates—a rule he famously violated to meet with Weizmann for the sake of his old business partner, Eddie Jacobson. Finally, after the Soviet Union reversed itself and supported partition, the UN General Assembly endorsed the plan. All Truman had left to settle was whether to approve the sale of arms to the Jewish forces—he would not—and whether to push for a UN trusteeship to implement the partition plan in stages or just leave it to the forces on the ground. The State Department argued for gradualism and against recognition of the Jewish state. Facing an uphill battle for re-election in the fall of 1948, Truman overruled it. It is at this juncture that Judis asks most daringly how things might have been otherwise. Great-power intervention, a more binational federal and international approach, and, in any case, a fairer territorial allocation to the Palestinians—could all of this have come to pass? After he became secretary of state in 1947, Gen. George Marshall would echo a preference for a UN trusteeship, as would George Kennan after he became chief of policy planning at the State Department. “By ruling out American intervention,” Judis writes, “Truman made it difficult to achieve what he continued to believe was the fairest outcome in Palestine. Relentless Zionist pressure made what was difficult impossible.” Presumably, John Kerry—with no presidential election looming—should get the point. Judis reinforces it with an afterword showing how AIPAC grew from an offshoot of Silver’s defunct Zionist group, and exhorting Kerry and his boss to bear down hard on Netanyahu. Judis wrote much of Genesis during Obama’s first term, when Netanyahu unleashed AIPAC—which seemed more invulnerable then than it has in recent months—to insinuate that the administration’s toughness on settlements meant that Obama was not enough of a “friend.” You can sense between the lines—and, at times, in them—Judis’s irritation with Netanyahu’s diplomatic jujitsu: “Palestine’s Arabs had still gotten screwed, and screwed by people who over the centuries had suffered even worse indignities, yet who had always claimed to stand for better.” Judis’s editor should have saved him from that line, but his pique is understandable. Moreover, one may argue, as I have myself, that given how small Israel and Palestine are as territories—together, about the size of greater Los Angeles—any reasonable two-state solution will require various confederal institutions to be improvised. In this sense, the Morrison-Grady plan was pointing in a sensible direction. Nevertheless, does its failure provide a distant mirror of current obstacles and lobbying? Not really. By Judis’s own account, Morrison-Grady could not solve the triangular tragedy that Palestine had become. Postwar Britain was broke, roiling with class turmoil, grieving its wartime losses and pulling back on colonial enterprises. As for the United States, enforcing immigration rights for Jews would have entailed a commitment of 50,000 troops—“our entire present ground reserve, both Marine and Army,” wrote Defense Secretary James Forrestal—which no American leader, from Truman and Marshall on down, was willing to entertain. Palestinian leaders opposed any great-power plan. UNSCOP had issued a minority report that pretty much echoed Morrison-Grady, which the Palestinians’ Higher Arab Committee rejected out of hand. They were convinced that the Arab armies couldn’t lose. Most of the world, including specialists at the State Department, assumed the same. The Zionists of Palestine, meanwhile, sensed a momentum that could not be reversed: “The appeal to halt our work,” Ben-Gurion had told the St. James Palace Conference in 1939, “resembles an appeal…to a woman who, after many years of childlessness, is about to give birth…. The mother cannot stop. It is possible to kill the child or kill the mother; but it is impossible to expect her to cease giving birth.” By the summer of 1946—in the wake of death camps and Stalinist purges—the ideal of a Jewish state, in whatever configuration, was as fiercely urgent for Labor Zionists as emancipation for black slaves was at the end of the Civil War. The month before Goldmann proposed partition, the Kielce pogrom, undertaken in part by soldiers and police officers, occurred in Poland. The only question that mattered to Zionists was how to win control of immigration, and the only plausible answer was independence from the Arab veto, backed by force of arms if necessary. In June, when the Haganah leadership—fearful that Britain would concentrate its regional military in Palestine—ordered elite Palmach units to cooperate with the Irgun and blow up most of the bridges connecting Palestine to neighboring Arab states, Britain conducted a sweep and arrested Palestine’s Jewish Agency leadership. Ben-Gurion escaped arrest only because he was abroad and had renounced armed struggle against the British. In July, however, the Irgun blew up the wing of Jerusalem’s King David Hotel that served as British headquarters; ninety-one people were killed and forty-six injured. So by the time of Morrison-Grady, both sides—Jews and Arabs—were looking beyond British rule. And each side assumed the other was capable of atrocity. Judis laments the eclipse in this toxic context of various Palestinian moderates who had accommodated themselves to British rule, if not Zionism. Correspondingly, he recalls the moderation of liberal Zionists like Hebrew University president Judah Magnes, whose Ihud movement advanced the idea of a binational state. But the heroes of historians are not necessarily heroes of the rank and file. Advocating on behalf of Morrison-Grady was, indeed, not unlike trying to stall the last stages of childbirth. Again, the one Arab state that had accommodated itself to partition—which was also the one Arab state with a proper British-trained army—was Jordan; Abdullah wanted Old Jerusalem for himself. The compression that Judis exerts on facts to mold them into a form fit for readers sick of AIPAC does not end here. Once you make “Zionist pressure” the rogue that foiled potential justice in 1946, it is not much of a stretch to make Zionist ideology a prior, immanent threat. In the end, over 700,000 Arabs were made refugees by the 1948 war. Is it possible that the Arab expulsions were the result of something more than Zionist ideology finally freed from British constraint? Which brings us back to the first part of the book. Judis carefully teases out various Zionist streams, especially the two main ones, political Zionism and cultural Zionism. I won’t dwell on their rivalry here, as I have in these pages before [see “A Tale of Two Zionisms,” October 15, 2012]. Suffice it to say that Judis distinguishes between them in ways that make the Palestinian Nakba and American Zionism’s current defense of the occupation more fated than would seem warranted if cultural Zionism were more deeply understood. The political Zionism of Herzl, Judis tells us, was determined to gain a Jewish state. Thus, he writes, political Zionism’s objective “meant ruling over or driving out the Arabs who already lived” in Palestine. Cultural Zionism, by contrast, saw modernity as a kind of solvent for Jewish religious forms and, as its founder Ahad Ha’am put it, sought to “secure refuge for Judaism and a cultural bond of unity for our nation.” Culturalists, moreover, recognized that the land was not empty. For Judis, then, the moral of the story is something like this: statists wanted a Jewish army, a Jewish majority and a sadly necessary ethnic cleansing; culturalists wanted co-existence and, say, a Hebrew University. To want a Jewish state was bad; to not want one, good. But what culturalists really wanted was to lay the foundations of a Hebrew-speaking civil society; to transform “Jews” from a religious community into a distinct nation in which individuals would be the arbiters of their identity—as moderns must be—yet remain organically connected to Jewish civilization. The question of statehood, or of any political configuration (state, federation, “national home” in the context of the Mandate), was for culturalists of less interest than finding a sustainable form of colonial settlement that would inspire actual immigrants and incubate an inclusive Hebrew culture. The Labor Zionists who came out of Gordon’s ethnocratic nationalism and Ben-Gurion’s nationalist socialism rejected Herzl’s strategy for creating a state…but they accepted his elementary commitment to establishing a Jewish state…. They also accepted Ahad Ha’am’s emphasis on gradually building a Zionist culture that could undergird a Zionist state, but they defined “state” and “nation” in such a way as to exclude Palestine’s Arabs. So Judis’s account of Zionism—defined by attitudes toward Palestinians and grasped from the Nakba backward—allows for no meaningful distinction between the Zionists who wanted non-Hebrew-speaking people out of their work spaces and those who wanted non-Jews out of their country. American Jews typically make this mistake about Zionism, because they experience “Jewishness” as a self-segregating religion and bloodline, celebrated by rabbinic law and imposed by anti-Semites, not as a culture into which others might be absorbed. They hear the phrase “Jewish state” and think of a big, scorned congregation with an army. They don’t think of the challenge of building a Hebrew political economy, growing organically in whatever land becomes available. Thus most American Jewish readers will readily assume what Judis does: that Ben-Gurion was being disingenuous, or merely tactical, when, by turns, he opposed Vladimir Jabotinsky’s call for a Jewish state at the 1931 Zionist Congress, then sought association with an independent Arab federation in 1934, then accepted a Jewish mini-state after the Peel Commission. The expulsions that occurred at Zionism’s climactic moment can be explained only if the Zionist ideal of an exclusivist state was there all along. In the north, the Israelis consolidated their control over the Eastern and Western Galilee region by taking Arab Nazareth…. In the center [where Lydda is], they cleared the road from Tel Aviv to Jerusalem, ending Jewish Jerusalem’s isolation from the Jewish state. The Arabs weren’t yet driven out, but they were beaten, as evident in their ready acceptance of the Security Council’s demand for a truce. Note the words “yet” and “beaten.” Actually, the Arab Legion was in the process of defeating the Palmach at Latrun, just a few kilometers away from Lydda, and Kibbutz Gezer had recently been evacuated at the cost of thirty-nine dead. From the summer of 1947 to the late spring of 1948, there were well over fifty attacks and counterattacks by Jewish and Arab forces. A book filled with facts and figures neglects to tell us that nearly 6,000 Jews died in the war, about 1 percent of the population—which would translate into something like 3 million Americans dying today. The Zionist side was contending with Jewish Jerusalem under siege, including bombings of the Palestine Post building and Jewish Agency headquarters. It was not until April, with the battle for the Castel, the arrival of 10,000 Czech rifles and the killing of Palestinian militia leader Abdel Kader al-Husseini, that Jewish forces turned the tide—only to await an invasion from all sides. Still, Judis sees no point in differentiating between the Irgun, which committed massacres around Jerusalem in the spring of 1948 (that is, before the invasion by the Arab states in May), and the Palmach, which acted in Lydda after the war was in progress. There is also no mention in Genesis of the Irgun’s effort to smuggle its own arms into Palestine in June, on the Altalena, and the Palmach’s sinking of the ship and suppression of the Irgun that same month. Most important, Judis does not explain why the residents of Nazareth, which was captured at nearly the same time as Lydda, were not driven out the way Lydda’s were. Readers of Genesis would assume that, given Zionism’s consensual imperative, all expulsions were just a matter of time. Yet Nazareth’s inhabitants were saved by a militant Zionist who also happened to be a Canadian recruit to the new Israel Defense Forces. Ben Dunkelman had fought in the Canadian army during World War II and, as chance would have it, became the local commander. He had secured a commitment from Nazareth’s residents to remain noncombatants. When he received a spoken order from the future chief of staff, Haim Laskov, to expel them a few days after Lydda, he simply refused. “I was shocked and horrified,” Dunkelman wrote. “I told [Laskov] I would do nothing of the sort—in view of our promises to safeguard the city’s people, such a move would be both superfluous and harmful.” He insisted that the order to evacuate the Arab population be in writing, which no senior officer was prepared to do. Ben-Gurion finally vetoed the proposal. Neither would Ben-Gurion put in writing the order to evacuate Lydda and Ramla a few days earlier, by the way; Palmach leaders Yitzhak Rabin and Yigal Allon complied with a wave of Ben-Gurion’s hand. Dunkelman was then offered a senior position in the IDF, but returned to Canada instead. Today, the residents of Nazareth are citizens of Israel, ambivalent, culturally hybridized, a challenge to Israeliness—but at peace. Among the expelled of Lydda and Ramla were Abu Jihad and George Habash, who would become leaders of political organizations willing to engage in grotesque acts of terror. I am not sure what Genesis gains, other than a kind of dramatic coherence, by depicting historical Zionism in just this way. Judis wants the occupation to end, the Obama administration to act and AIPAC’s rhetoric to be challenged—as he should. But “Zionism” does not explain what happened in postwar Palestine, nor does the Zionist lobbying of people like Silver explain why so many influential American politicians and artists—from Senator Taft to Pete Seeger—urged American help to get the Jewish state off the ground. Most Americans, reasonably enough, thought that Zionists were fighting for the greater part of justice—and their lives. This is a far cry from Bibi mobilizing his plutocrat friends, spinning Jewish pathos to deflect attention from the West Bank settlements. Judis catches himself at the end of his book, insisting that, in telling the story the way he has, he does not mean to leave the impression that Truman could have easily forced a binational solution, or that Ben-Gurion could have been “more amenable to compromise,” or that the Palestinians should have turned from the Mufti. Judis insists that his key point is that the Palestinians were wronged in a way that can be righted now. Fair enough. But I’d argue that Judis, whose distaste for political violence is evident throughout, is making a bigger, better point about this conflict, though without quite acknowledging it. Wolfgang Schivelbusch, in his remarkable book The Culture of Defeat, gives cause to reconsider whether, for instance, the awful violence of the American Civil War precipitated such a torrent of suffering—not just the war deaths, but the 100 years of Jim Crow inflicted by a desolate, recalcitrant South—that the war to abolish slavery might have finally done more harm than good; whether slavery might well have been abolished anyway in a generation or two owing to Northern industrialization, and avoiding war might have been more visionary. Judis’s Genesis makes us rethink not only whether extending the Mandate, or a UN trusteeship, might have been possible and just, but also whether war ever does anything but confound the defensible revolutionary ends for which it is fought. Yet the answer to that question is not obviously negative. Judis might have been clearer—not just in his book’s conclusion, but in its structure—about the baby being born when it had to be, and that the timing of its birth cannot be brought as evidence against its adult offenses. Understanding Israel’s founding in 1948 as a necessary event with tragic consequences, and not as a presidential mistake forced by political pressure, will not make Obama less wary of AIPAC or his relationship with Netanyahu less tortured. But it could make his tact more obviously noble.